Sixteen-year-old Joshua Allen was born with an extra chromosome-a genetic aberration known as Trisomy XXI, or Down Syndrome. A serious accident leaves the mentally-challenged adolescent in a coma at the hospital, where he receives a mysterious injection that endows him with supernatural powers. The transformed teen is linked to a string of bizarre, unexplained deaths in town that have both the sheriff and the coroner baffled. A ghastly creature from another planet lands on Earth and begins its hunt for the teenager-viciously slaughtering anyone in its path in order to complete its deadly mission. The salvation of an entire race of aliens is in the balance, as Joshua and his friends are thrown into a horrific life-and-death struggle with the seemingly indestructible extraterrestrial being. Never judge a book its cover is the phrase that people use alot, and in this case it is definitely the truth. 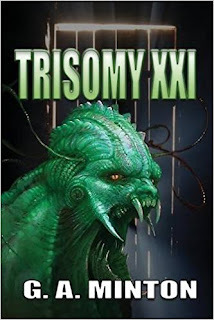 Whilst the awesome looking alien on the cover is featured in the book you have a hard slog to get to meet this creature. Following Joshua a boy with down syndrome who is constantly bullied, ends up in a horrible accident he is miraculously changed over night. Now a vicious alien is after him but what is the reason behind this creatures hatred towards the boy with the extra chromosome? G.A. Minton's debut novel shows that he has a talent for writing and it is a shame that he has a tendency to use overly long descriptions of certain situations which really distract you from wanting to continue reading on. What can easily be said in a sentence ends up becoming a paragraph or in some cases a whole page. Be prepared whilst reading this book that you will come across words that many wouldn't use on a daily basis and that dictionary you have tucked away may come in use once again. The second half of the book shows definite improvement but for some this may be a little too late. He proves that he has a love for horror and science fiction throughout with several nods to some of the genres best works. It would be interesting to see this book turned into a film though I suspect alot of it will be changed about so it doesn't become a drawn out filler filled film. G.A. Minton is currently hard at work on his second book, here's hoping its an easier read then TRISOMY XXI and the descriptive pitfalls that were in this book will be eradicated for the next novel.